According to a recent Appcelerator survey, enterprise have built few mobile applications so far, but they intend to build more this year considering 2013 as the year when the number of mobile apps created will surpass those for the desktop. The report includes other details on the enterprise mobile space. Traditional software vendors show little leadership in mobile, only 28.3% of the respondents considering Microsoft as being a leader in mobile development, SAP – 15.8%, Oracle – 10.8%, IBM – 7.3%, and HP – 4.6%. Almost half of the respondents think that HP and Oracle do not understand the mobile phenomenon. 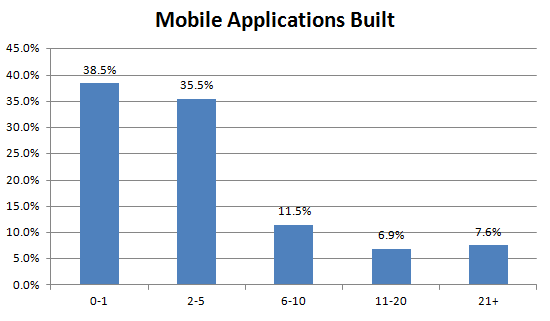 Enterprises intend to build more mobile applications in 2013: 0-1Apps – 20.1% and 2-5Apps – 44.4%, resulting that 64.5% will build up to 5 apps this year. 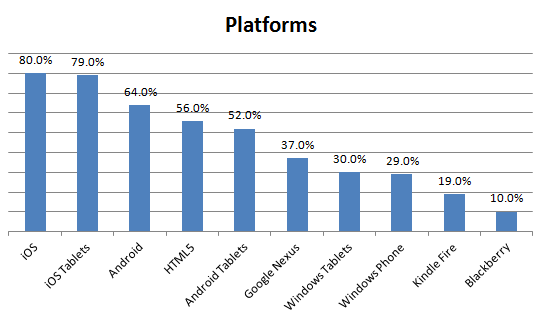 Also, 10.8% of the respondents declared their intention to build more than 20 apps in 2013. In spite of that, only 44% of the companies have a comprehensive mobile strategy, 22% being unclear on the business case for one, and 30% lack the time or resources needed. The main obstacles in enterprise mobile success is: 54.3% – lack of resources, 40.9% – lack of technology standardization, 26.5% – lack of strategy, 24.9% – integration with enterprise data. When it comes to data sources, enterprises connect their mobile applications with CMS – 44.7%, Microsoft DBs – 39.1%, Oracle – 29.2%, SharePoint – 29.6%, SAP – 19.8% and Salesforce.com 17.9%. The report was based on 770 responses coming from executives having various managerial positions - IT Manager – 29.5%, Development Manager – 16.6%, CEO – 15.3%, Marketing Manager – 11%, VP – 9%, Mobile Manager – 6.9%, CIO – 6.2%, Enterprise Architect – 5.5%-, and with the following geographical distribution: North America – 60.1%, Europe – 25.7%, Asia Pacific – 8.1%, Latin America – 4.3%, and Africa – 1.8%. The survey was carried from Nov. 15 to Dec. 1, 2012.